Here’s the new bird family tree. It’s amazing. Unlike previous studies that had to rely on, relatively speaking, just a few bits and pieces of DNA, Jarvis et al. processed the entire genomes of 48 bird species and compared nearly 42 million base pairs of DNA (Hackett et al. were revolutionary for using 32,000 base pairs!) in a massive computational effort that — as the authors point out with what I imagine must be glee — would have taken a single computer processor more than 400 years to accomplish. In mid-2008, Nick Sly published a review of Hackett et al. titled Avian relationships – What do we know? Now it’s late 2014, six and a half years later, and here’s what we know today. Open Jarvis et al.’s bird family tree in a new tab and follow along as you read. The avian ancestors of ratites (the flightless ostriches, emus, kiwis, cassowaries, rheas, and extinct moas and elephant birds) and tinamous stopped interbreeding with the ancestors of all other living birds about 100 million years ago, more or less when Spinosaurus was paddling around North Africa and feathered Deinonychus was running around what’s now the western United States. Tyrannosaurus rex didn’t exist yet. Together, the ratites and tinamous are called paleognaths, and all other living birds are called neognaths, named for differences in their skulls. This divide is the oldest among all living birds. Several recent studies have found that tinamous are embedded within the ratites, which means that either they regained the ability to fly or (as many researchers feel is more likely) that flightlessness and large body size arose multiple times within the paleognaths, a topic discussed in detail at Tetrapod Zoology. 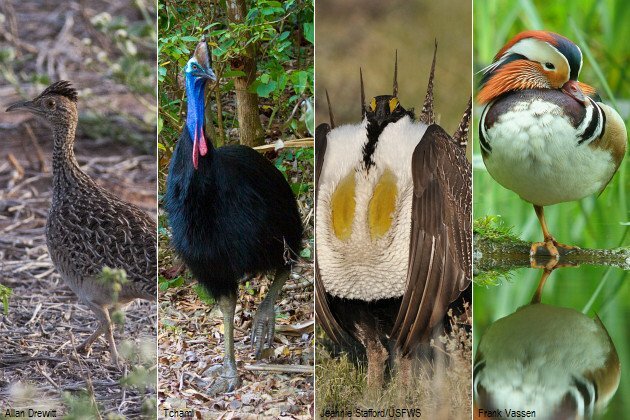 We should probably think of birds like kiwis and cassowaries not as “primitive” early birds but as highly specialized birds with many derived traits. The new 48-genome analysis included only ostrich and tinamou DNA, so it doesn’t shed further light on paleognath interrelationships, but it does reinforce their distinctiveness from all other living birds. Now we move on to the Neognathae, which also has two very deep branches that lead to all the other living species of birds. Jarvis et al. date the split of those branches to 88 million years ago, well before the extinction event that wiped out all non-bird dinosaurs and many other forms of life about 66 million years ago (the K-Pg boundary). One of the neognath branches is called Galloanserae and consists today of the the Galliformes or landfowl (megapodes, guans, guineafowl, patridges, pheasants, grouse, turkeys, quail, and relatives) and the specialized aquatic Anseriformes or waterfowl (ducks, geese, swans, and related waterfowl, along with the weird South American screamers). Have you noticed ducks and quail replacing loons and grebes at the beginning of newer bird field guides and checklists? This is why. One of the other papers released last week identified chickens — of 21 species studied — as having the most similar genome “to the common avian ancestor, probably a bipedal feathered dinosaur” (Romanov et al. 2014). That means that with all the early branching that went on among ancient birds, and everything that has happened since, chickens have undergone the fewest genetic changes. 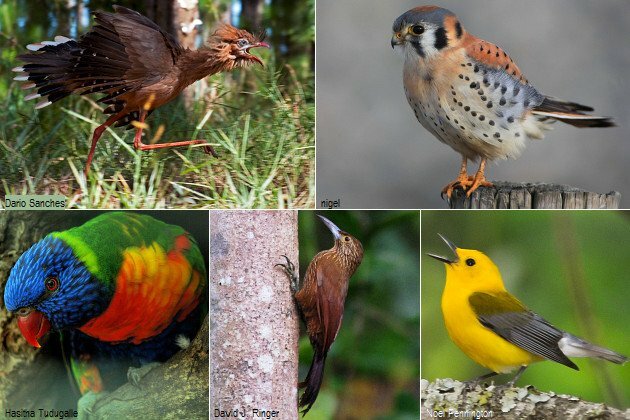 They have conserved features most in common with the ancestors of all birds! Determining relationships within Neoaves has been extremely difficult, driving scientists to wrong conclusions (or baffling them completely) for hundreds of years. We thought storks and New World vultures were sister taxa for a hot minute in the ’90s; flamingos used to be classified with other lanky wading birds, while grebes were classified with loons; and for all anyone knew, the Hoatzin was practically as likely to be a highly evolved bovine as anything else. Why is this? The extinction event that wiped out the pterosaurs, the non-avian dinosaurs, and so much other life created enormous opportunity for new organisms to diversify and thrive (lucky for us placental mammals! ), and scientists had been coming to the conclusion that Neoaves was the product of a rapid burst of speciation during this period that obscured evolutionary relationships: in short, that birds were too busy living — eating, being eaten, experimenting, dispersing, and repopulating the world — to leave behind enough clues in stone or in their DNA, at least what we’d been able to analyze so far. Jarvis et al. also found evidence of an “an explosive diversification within Neoaves … around the K-Pg boundary,” an explosion that lasted about 15 million years, and — by virtue of their whole-genome approach — researchers were able to make significant progress in untangling the story of what happened just before and during that exceptional period in the history of life on Earth. Here’s where things get really interesting. Let that sink in. 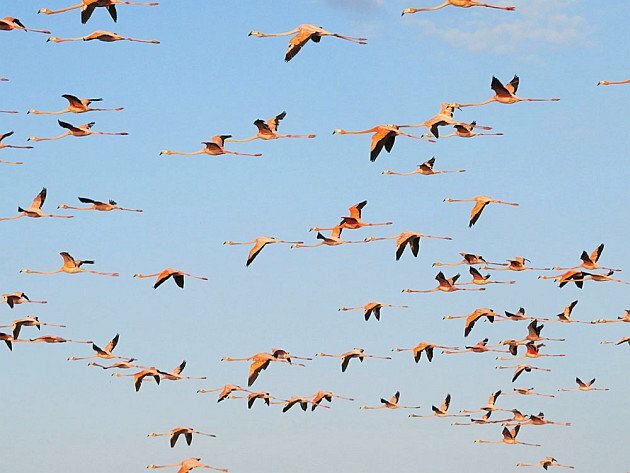 Birds didn’t just adapt to swimming and wading or various terrestrial habits once, they did it over and over again. The sister group to Columbea is Passerea, which contains all other living birds not already discussed. Within Passerea, the first branch contains sister clades: a novel cuckoo-bustard-turaco group and then a night bird-swift-hummingbird group. Cuckoos were found to be sister to bustards and turacos. It’s an intriguing proposal — none of these birds had belonged much of anywhere before (heck, bustards were dumped in Gruiformes with cranes and rails) — and it means that birds adapted either to arboreal or to ground-dwelling lifestyles more than once within the clade. Cuckoos have both highly arboreal and firmly terrestrial species, while the turacos are primarily jungle tree-dwellers and bustards live on the ground in open country. Sister to this group is the Strisores: the “night birds” (excluding owls), swifts, and hummingbirds. While these groups were once considered two orders (Caprimulgiformes and Apodiformes), recent work (summarized in Mayr 2010) shows that swifts and hummingbirds emerged from within the night birds. The Oilbird, potoo, and frogmouth lineages are old and distinctive. A study earlier this year even hinted that the Oilbird may have diverged from other members of its clade before the K-Pg boundary, but that doesn’t seem to jibe with Jarvis et al. (though the confidence intervals don’t seem to rule it out entirely, either, as far as I can tell). In any case, these are very old branches. The position of Strisores relative to all other bird groups is important for a reason you might not expect, and it has to do with hummingbirds. Hummingbirds have an ability that’s rare in nature: They learn their vocalizations. So do parrots, some songbirds, humans, and a few other mammals. Where do these abilities come from? Papers on vocal learning in birds and mammals were part of the package released last week, and they paint a picture that’s absolutely amazing: “… convergent neural circuits for vocal learning are accompanied by convergent molecular changes of multiple genes in species separated by millions of years from a common ancestor…” (Pfenning et al. 2014). See what just happened there? Humans don’t share merely a similar capacity for vocal learning with hummingbirds, we share share similar brain machinery, and that brain machinery is regulated by similar genes, genes not shared by hummingbirds’ closest relatives, nor by ours. We know that morphological features, like webbed feet for swimming, can evolve independently (and we’re learning that this sort of convergent evolution is more common than we thought in birds, as already discussed above), but now we’re also learning that genes can evolve convergently as well. I asked Dr. Jarvis on Twitter whether I was understanding this correctly. Here are two other tweets on the topic. Follow him on Twitter — he’s regularly tweeting great highlights from the research project. A Home for the Hoatzin? OK, if you’re still following along on the tree, the next branch we reach is a novel proposal: Hoatzin as sister to Charadriiformes and Gruiformes. The Hoatzin, which may have reached South America by raft, has resisted placement in basically every study ever done. So now that its whole genome has been sequenced and the bootstrap values for placement as sister to cranes and plovers are relatively strong, does it finally have a home? It’s also worth noting here that the Gruiformes of today is different from that of a decade or two ago. It’s smaller, restricted to the trumpeters, Limpkin, cranes, finfoots, flufftails, and rails, coots, and gallinules. 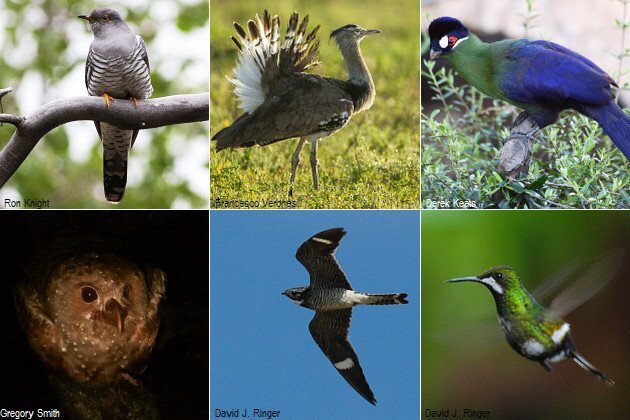 Other taxa stuffed in Gruiformes at various points through history — Kagu, Sunbittern, mesites, buttonquail, seriemas, bustards, and others — are now distributed throughout the entirety of the Neoaves. Charadriiformes is a successful, widespread group of birds that includes the plovers and sandpipers, gulls and terns, skuas, alcids (or auks, if you prefer), and many other smaller but very interesting groups, from seedsnipes to sheathbills. The world’s three pelagic tropicbird species were long lumped with pelicans and cormorants because of their totipalmate feet (all four toes, not just three, are webbed), but it’s become clear in recent years that they don’t belong there at all (nor are pelicans and cormorants all that closely related, but more on that in a moment). Meanwhile, New Caledonia’s Kagu and the South American Sunbittern, neither strong fliers, were plucked from Gruiformes and identified as sister taxa, but where they fit relative to other birds was unknown. Two years ago, McCormack et al. 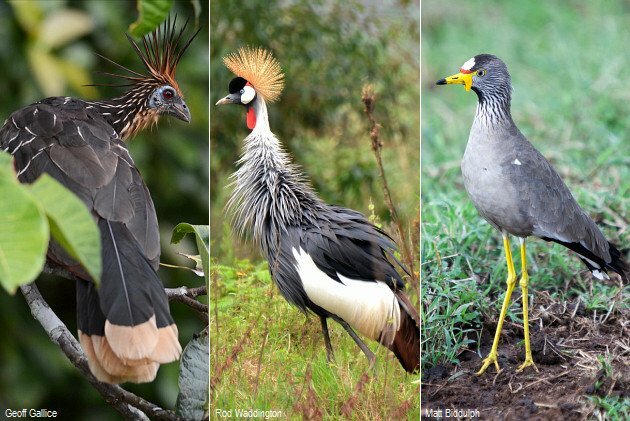 found evidence that these five odd birds might be each other’s closest relatives. 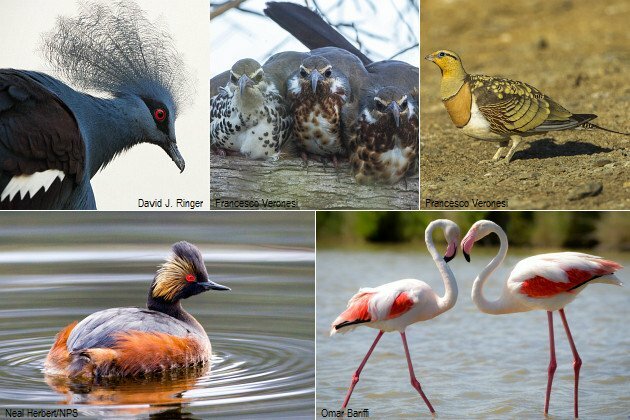 And the new whole-genome study lends strong support to this relationship (dubbing the clade “Phaethontimorphae”), and places the group (with somewhat less certainty) as sister to the “core waterbirds,” which are up next. From here, the rest of the Neoaves is divided into two large sister groups: core waterbirds (plus Phaethontimorphae) and core landbirds. 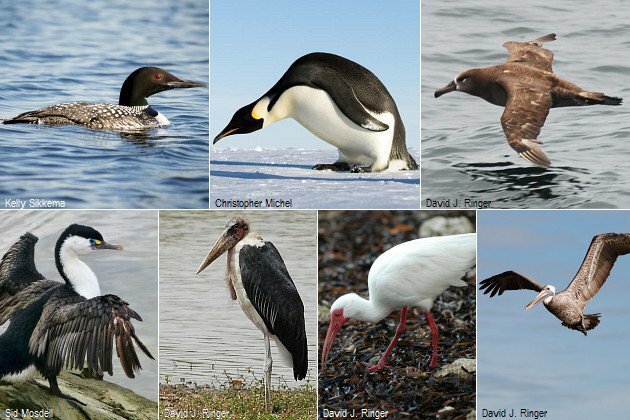 This major radiation of water-adapted birds includes loons, penguins, and the remarkable tubenoses along with a variety of totipalmate and wading birds. Some are highly aerial, capable of staying aloft for days or weeks at a time; penguins have given up flight altogether to become efficient wing-propelled swimmers. The new tree confirms Hackett et al.’s placement of foot-propelled loons as basal to the whole group and penguins and tubenoses as sister taxa. The divisions among these lineages arose during the rapid speciation event following the K-Pg boundary, so these birds are more closely related to each other than to anything else but hardly “close” relatives. Relationships among the totipalmate and wading birds are still being sorted out, and Jarvis et al. did not include enough taxa to resolve some of the lingering questions, such as where storks fit. Frigatebirds, gannets and boobies, cormorants, and darters form a well-supported Suliformes. Pelicans are separate but are related to Hamerkop and Shoebill, and that group is related to herons and ibises. Herons and ibises may or may not be sisters, and storks may be basal to the whole pelecanimorph assemblage, or to the herons. Jarvis et al. didn’t sample enough taxa to resolve these questions, so the deep relationships among these groups will need further work. 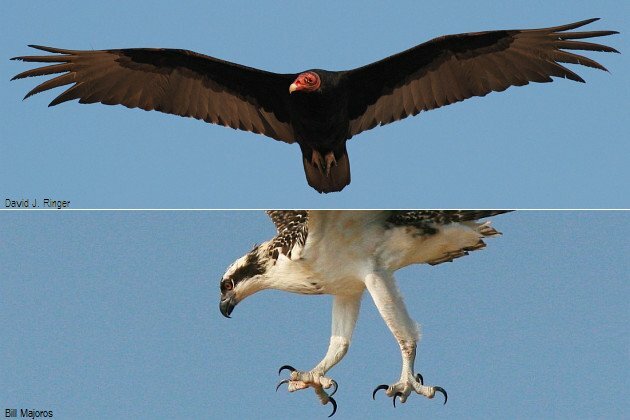 “New World” vultures (in scare quotes because they have fossil relatives from the Old World) and hawks (including Osprey and Secretarybird but, importantly, not falcons) are sister taxa and split off from other members of the Afroaves clade early on. It looks as though “New World” vultures are sister to hawks and eagles after all, not anything stranger or more exotic (and certainly not storks). 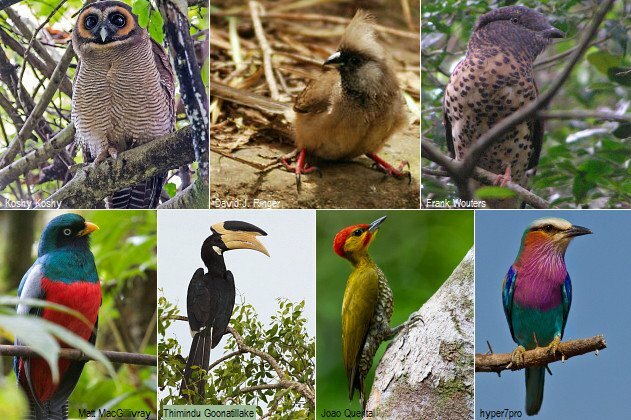 With the basal raptors out of the way, the rest of the Afroaves tree looks like this: owls, mousebirds, Cuckoo-Roller, trogons, hornbills, Piciformes (jacamars and puffbirds, toucans and barbets, honeyguides, and woodpeckers), and Coraciiformes (bee-eaters, ground-rollers, rollers, todies, motmots, and kingfishers). Even in the with full-genome analysis, owls posed a bit of a problem, which the authors attribute to the rapid diversification following the K-Pg boundary. However, they note that the irresolution is “local” (i.e., owls belong in this general vicinity in the tree, not somewhere wildly different), so perhaps future work can more accurately resolve the placement of owls relative to mousebirds and the other Afroaves, but it seems that these challenging groups (including the Cuckoo-Roller) are finally settling down. The most important result in the Trogoniformes through Coraciiformes section of the tree is further confirmation that these birds are not exactly “near passerines” as once thought — passerines are more closely related to three other groups of birds. Eight years ago, Ericson et al. shocked everyone with a suggestion that passerines were most closely related not to woodpeckers and kingfishers but to parrots, falcons, and seriemas. Hackett et al. found the same thing, and then Suh et al., and others, and now the full-genome study gives a resounding affirmation to the whole thing. Passerines are roughly half of all living birds; their own tree is quite complex, with many questions still unresolved. Parrots are still getting sorted out too. But that’s all beyond the scope of the whole-genome studies released this month, and of this post. Perhaps I’ll tackle passerines on some other occasion. Meanwhile, we have a robust new tree to help us understand bird diversity, and the technical accomplishments pioneered in this project will influence future work significantly. Some of our longstanding questions now have really fascinating answers, and if others are still open or if new ones have been raised, we now have greater knowledge and freer imaginations with which to pursue them. So if you need me, I’ll just be over here thinking about doves and flamingos, parrots and falcons, hummingbird brains and our own. I might be awhile. David J. Ringer is exploring the world one bird at a time. His fascination with birds and nature began at the age of four or five, and he now works full time in conservation. He is a writer and communicator whose day jobs have taken him to six continents and more than 25 countries, including Papua New Guinea, Vanuatu, Kenya, and Cameroon. Follow him on Twitter at @RealDJRinger. Thanks for the excellent summary. Thank you for posting such interesting stuff about this magnificent group of animals. Thanks a lot for this analysis ! It’s really cool to read someone passionate and invested. Really terrific images. Nature has very rich colors. Nature always fascinated me. Thank you. Where do you see a well supported Suliformes in this Jarvis et al 2014 article? Not in Figure 1 or figure 2. Please, if someone else sees this, I’d like to know. Gifts to impress a female friend!